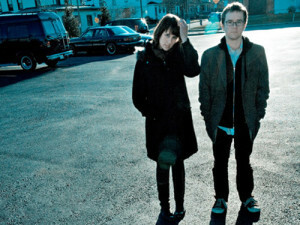 Earlier today, indie folk duo Wye Oak announced a short run of tour dates with Future Islands for March of next year. The two-week trek, which will take the band through the southeastern United States, also includes an appearance at South By Southwest in Austin, Texas. Following the festival, they will hop across the pond for four shows in Europe. There’s not a lick of guitar on this whole record. It basically inverts what we were responsible for. Andy was playing droney bass lines on keyboard. Now he’s responsible for the more upper register stuff that guitar would normally handle, while I’m playing bass lines on a bass guitar. The idea was really appealing to me because we had sort of hit a wall, just with the complete and total excess of touring that we had done, the use and overuse of that format. It tainted the guitar for me and I was finding it really, really hard to get anything out of it from a writing perspective. I wasn’t excited about it — too much baggage. It just felt tired to me. Check out the band’s full list of upcoming tour dates after the break. Really bummed that they’re dropping guitar. It’s mostly what made the past releases apart from her vocals but I guess I’ll be interested to hear the new stuff and hopefully not be disappointed.